The “Shadow Wrap” method for short rows has been “unvented” by Alice Yu. I discovered it when knitting some of my first pairs of socks out of her great book Socktopus (2011, ISBN: 978-1861088529). The Shadow Wrap is a clean method to execute short-rows, which looks neat on both sides of the fabric and doesn’t create any holes. For ease of use in my patterns, I have “unvented” the abbreviations sh-w-k and sh-w-p to indicate a shadow wrap worked into a knit stitch, or into a purl stitch. I have extended the vocabulary of the shadow wrap method to include triplet stitches, with reference to Alice Yu’s “twin stitches”. A triplet stitch is created when a shadow wrap is worked onto a twin stitch. 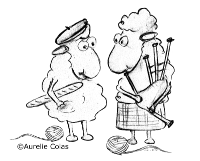 When knitting or purling the twin (and triplet) stitches to close the short-row, one must knit or purl the twin (or triplet) stitches together, as if they were one. In other words, all the “children” of the “mama-stitch” should be knitted (or purled) together.